Every single night I sleep with this heated throw. It works perfect, shuts off automatically and it is very comfortable. I would definitely recommend. Functional (and washable! ), but has not stood the test of time. The Berber side of the throw has become rather unsightly... it is matted and attracts lint and fuzz that the gentle washing can’t remove. I definitely recommend opting for a darker color or a throw without the reverse Berber side. Loving this...and so is my cat! Really nice blanket:soft, cozy, warm even by itself (not using heat feature). Love it. Perfect size for using on the couch. Beware, your dog may steal this from you... Warm and the flexibility with the settings keep you comfortable. Super soft and I really appreciated all the color options. A nice size to snuggle up and a great addition to a cold movie night in. Perfect heated throw. Easy to set up, easy to work. Stays warm. Very good value and love it in the winter! I ordered the tan and it’s very neutral. It's beautiful, soft and perfect. I love it! I used this blanket for a week, but there's nothing like a soft heated blanket on a snowy day. It's super relaxing and eases tension even further when I get in the bed. The color is great and it so soft. My kids love to curl up with me. I like! I work from home at a desk job in an old house and this makes winter tolerable! I use it almost every business day all winter. 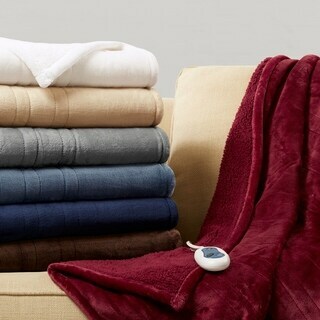 This would be the perfect 5 star heated throw without the sherpa side. That side tends to collect lint and dust and look dirtier than the other side without the sherpa surface. It has a 2 hour shut off which is occasionally annoying, but it's probably saved me from leaving it on all night more than I care to admit. My husband and I bought two of these to use on our bed because they were the right size and we loved the two-sided blanket aspect. They are sold as a throw blanket, and we soon learned they don't work as a bed blanket like we hoped they would--the wires get in the way, and they don't stay in place. Still, we love the blankets and will keep them to use in the living room on cold, windy nights. As I get older I find I am always cold. Now I can warm up whenever I need to. This blanket is perfect for warming up and easy to use. My 86yr old dad is cold most of the time (especially his hands and feet) from early fall till almost summer and almost bakes my mother out of the house with the thermostat being so high..and the fireplace blazing. I thought we would try a heated throw as he sits alot in his recliner due to his problems with ambulation. It is hard to find a gift he can utilize or likes anymore, but he said he LOVES his blanket. It is larger than most throws and covers him nicely, chest to his feet. The blue color is beautiful and the blanket is so soft. Great gift and would highly recommend.